Stems: Erect or ascending, single or much branched from base, usually branching above, silky-hairy. Leaves: Alternate, short-stalked, odd-pinnately compound, 1 to 3 inches long, 1/4 to 1 inch wide; leaflets 15-31, elliptic to obovate, 1/4 to 3/4 inch long, silky-hairy, often folded lengthwise; margins entire; tips pointed or blunt. Inflorescences: Racemes, 1.5 to 4 inches long, loosely- to densely-flowered, on stalks in leaf axils near ends of branches. Flowers: 5-parted, up to 1/2 inch long; calyces swollen on 1 side, stiff-hairy, often purplish; corollas papilionaceous, white to cream; banner conspicuous, wider above middle; wings asymmetrical; stamens 10, separate. Fruits: Pods, 1 to 2.75 inches long, beaked, constricted between seeds; seeds 1-7, smooth, olive-green or brown. Habitat: Dry prairie hills, plains, stream valleys, and roadsides. Distribution: Principally west 1/2 of Kansas. Toxicity: The foliage and seeds are thought to be toxic to livestock. Uses: Native Americans chewed the sweet-tasting roots. Comments: Silky sophora often forms extensive colonies. 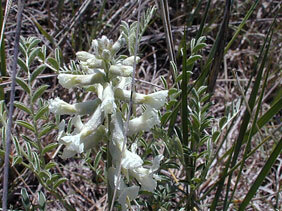 It resembles milk-vetches (Astragalus ssp.) but differs in having 10 stamens that are separate and a keel that is beaked rather than rounded.